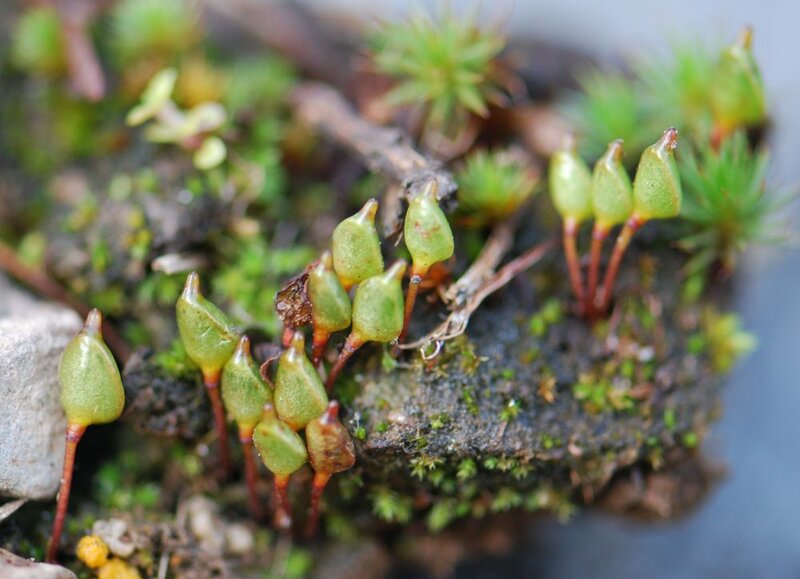 Bug moss, bug-on-a-stick, humpbacked elves, elf-cap moss… Who knew there could be so many names for such tiny mosses. Despite their small stature, the mosses in the genus Buxbaumia have achieved something of a celebrity status to those aware of their existence. To find them, however, you need a keen eye, lots of patience, and a bit of luck. Buxbaumia comprises something like 12 different species of moss scattered around much of the Northern Hemisphere as well as some parts of Australia and New Zealand. They are ephemeral in nature, preferring to grow in disturbed habitats where competition is minimal. More than one source has reported that they are masters of the disappearing act. Small colonies can arise for a season or two and then disappear for years until another disturbance hits the reset button and recreates the conditions they like. I say you must have a keen eye and a lot of patience to find these mosses because, for much of their life, the exist on a nearly microscopic scale. Buxbaumia represents and incredible example of a reduction in body size for plants. Whereas the gametophytes of most mosses are relatively large, green, and leafy, Buxbaumia gametophytes barely exist at all. Instead, most of the “body” of these mosses consists of thread-like strands of cells called “protonema.” Though all mosses start out as protonema following spore germination, it appears that Buxbaumia prefer to remain in this juvenile stage until it comes time to reproduce. Considering how small the protonemata are, there has been more than a little confusion as to how Buxbaumia manage to make a living. 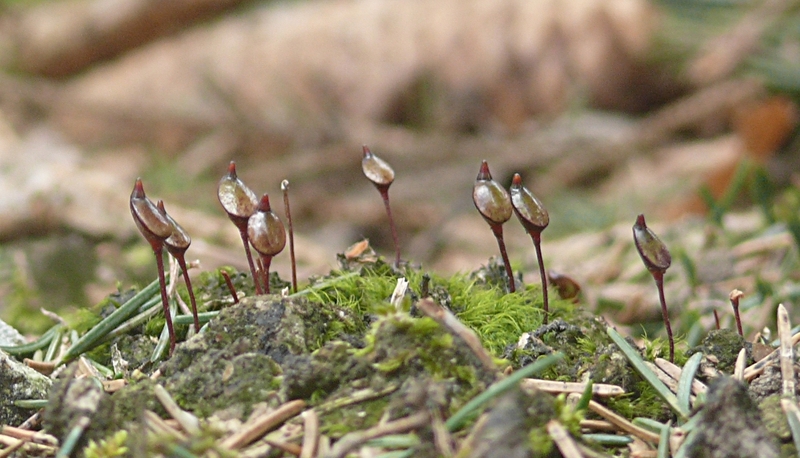 Early hypotheses suggested that these mosses were saprotrophs, living off of nutrients obtained from chemically digesting organic material in the soils. However, it is far more likely that these mosses rely heavily on partnerships with mycorrhizal fungi and cyanobacteria for their nutritional needs. It is thought that what little photosynthesis they perform is done via their protonema mats and developing sporophyte capsules. Speaking of sporophytes, these are about the only way to find Buxbaumia in the wild. They are also the source of inspiration for all of those colorful common names. Compared to their gemetophyte stage, Buxbaumia sporophytes are giants. Fertilization occurs at some point in the fall and by late spring or early summer, the sporophytes are ready to release their spores. The size and shape of these capsules makes a lot more sense when you realize that they rely on raindrops for dispersal. When a drop impacts the flattened top of a Buxbaumia capsule, the spores are ejected into the environment and with any luck, will be carried off to another site suitable for growth. I encourage you to keep an eye out for these plants. It goes without saying that data on population size and distribution is often lacking for such cryptic plants. Above all else, imagine how rewarding it would be to finally cross paths with this tiny wonders of the botanical world. Happy botanizing!